Hocus Pocus is getting a 25th anniversary celebration this Halloween. Freeform has announced that the network will be including a Hocus Pocus 25th Anniversary Extravaganza as part of their annual Halloween-themed programming block this year. Not only that, but instead of the usual 13 nights, the network has announced they are going to extend the event for the entire month of October, now branded as 31 Nights of Halloween. This Hocus Pocus event is just part of what the network has in store, but will no doubt be something 90s Disney fans will be looking forward to. Freeform's spooktacular festivities this year will indeed include a celebration for one of the most beloved Halloween movies with the Hocus Pocus 25th Anniversary Extravaganza. Freeform made the announcement during their upfronts presentation, but they unfortunately didn't provide any additional details. They did, however, take to Twitter to share an image confirming the event that features the three beloved witches, Winifred, Sarah and Mary. "Amok, amok, amok! The #HocusPocus 25th Anniversary Extravaganza is coming to Freeform during #31NightsOfHalloween. #FreeformUpfront"
Freeform is expanding its holiday programming block by beginning the holidays early on Oct 1st with 31 Nights of Halloween. In addition to the Hocus Pocus celebration, part of that block will include Decorating Disney: Halloween is coming! From the executive producers of the Disney's Fairy Tale Weddings series, Ann Lewis Roberts, Simon Lythgoe and Jenny Daly, this behind the scenes special will reveal all the tricks and treats behind the transformation of the Walt Disney World and Disneyland resorts into the scariest, yet still magical, places on Earth. But considering the event will feature more 1,000 hours of programming, Freeform will surely have more up their sleeves. 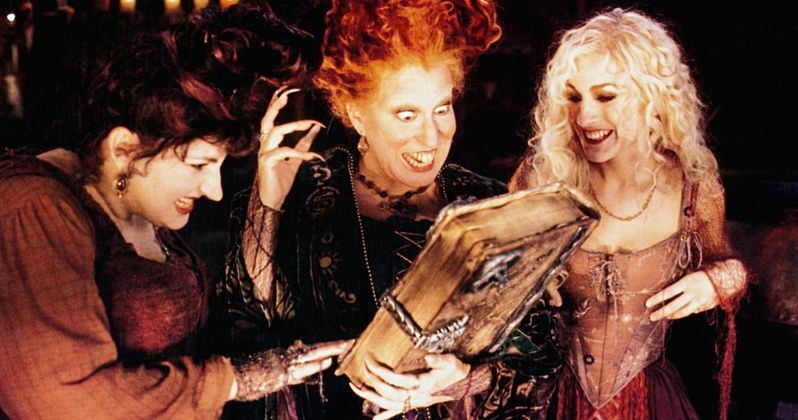 Originally released in 1993, Hocus Pocus, which stars Bette Midler, Sarah Jessica Parker, and Kathy Najimy as three witches who rise from the dead to torment a small, unsuspecting town on Halloween, has gone on to become a favorite for many who grew up in the 90s. The movie didn't do much at the box office, bringing in just $39.5 million, and also didn't work for critics at the time, sitting at just 30 percent on Rotten Tomatoes. But it's now sort of a cult classic in its own way, which is why it warrants a 25th anniversary celebration this year. The movie has found a large enough audience over the years that there has been consistent talk of a sequel. Last we heard, Hocus Pocus 2 has been turned into a made-for-TV remake for either Disney Channel, ABC or Freeform, interestingly enough. Maybe they're going to actually announce the movie during this celebration? We know that Bette Midler wasn't too happy about the idea of a remake as opposed to a sequel though. Perhaps they've changed their minds and are going to go back to doing Hocus Pocus 2. We'll have to see for ourselves this October. You can check out the announcement from Freeform for yourself below. Hocus Pocus 2 Happening as a TV Movie with Original Cast?